Join us for a tour of the city of Berlin which was long divided, illustrating the division of the world into two blocks. We'll return to the ship for lunch. Enjoy a free afternoon in Berlin. Dinner will be served on board. We'll head out for a tour of Berlin by night. We'll leave for the excursion to the Charlottenburg Palace. Our ship will then depart for Potsdam, which we will reach at the beginning of the afternoon. When we arrive, we'll set off on an excursion to Potsdam and the gardens of the Sanssouci Palace. We'll return back on board at the end of the afternoon and continue to cruise in the direction of Brandenburg. Our ship will begin to cruise early in the morning for Burg. Join us for a tour of Magdeburg, situated midway on the Elbe River and the historic Roman Roads. Its cathedral is one of the most important of Gothic-style edifices in Europe. 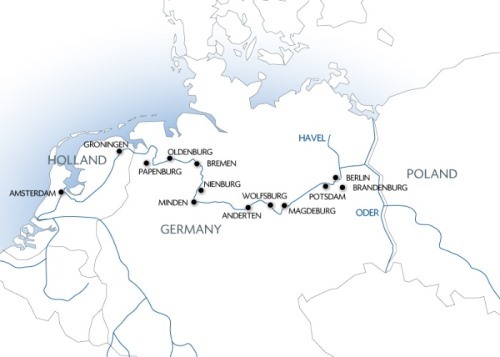 During this time, the boat will sail to Magdeburg, where we will board it at the end of the afternoon. Enjoy some free time this evening to explore the city on your own. We'll begin to cruise early this morning for Carlvoerde. Join us for a visit to the Autostadt, a combination of automotive theme park and museum with separate buildings for each VW brand. During this time, the boat will sail to Wolfsburg, where we will board it at the end of the afternoon. The ship will leave for Anderten. Our ship will depart early for Hanover, arriving at the beginning of the morning. We'll then set off on an excursion to Hanover. The capital of Lower Saxony, Hanover is one of the main economic centers in Germany. During this time, the boat will continue its course for Minden. We'll board it again and continue to cruise to Nienburg. Our ship will cruise through the rest of the day. Transfer for the a tour on your own of the "Red Town” which has a magnificent Town Hall from the Weser Renaissance. During this time, the ship will continue its course for Hoya, where we will board it once again. We'll spend the afternoon cruising to Bremen. Join us for a tour of Bremen (walking tour), the oldest maritime city in Germany and the second largest trading port in Germany after Hamburg. We'll then return on board and depart for Oldenburg. Enjoy a stroll in the city before we board our ship again and begin to cruise towards Dörpen which we will reach during the night. We'll begin to cruise early in the morning for Papenburg. Join us for a tour of the Meyer Werft shipyard. We'll return on board and leave for Groningen. We'll begin to cruise early in the morning, spending the day cruising to Amsterdam. In the morning, join us for a tour of the city of Amsterdam. In the afternoon, we'll leave for an excursion to Volendam and the Zaanse Schans. This evening, join us for a canal boat tour of Amsterdam. Enjoy some time on your own in Amsterdam this morning before disembarking. End of our services. Explore the northern canals by cruising the Elbe and the Havel. You will discover the history of Berlin, before exploring Potsdam, Magdeburg or Bremen, cities that will make you appreciate the eclectic heritage of Germany. You will have the option to visit the Meyer Werft shipyard before diving into the heart of charming Dutch cities. Your cruise will end in Amsterdam, famous for its UNESCO World Heritage canals.